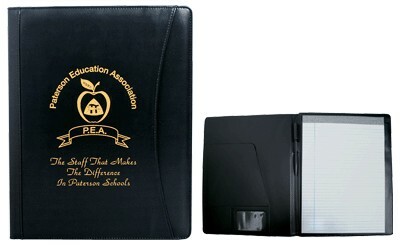 Features: * Leather-like cover with a full sized pocket on the front for easy access to important papers. * Front inside slip pocket with slot for notes. * Pocket with window for business cards. * Built in pen or pencil holder. * 11-1/2" H x 8" W notepad included. * Actual size is 12-1/2" H x 9-3/4" W.
80 1 color(s) imprint at $619 ONLY $7.74 each. 150 1 color(s) imprint at $1,068 ONLY $7.12 each. 250 1 color(s) imprint at $1,672 ONLY $6.69 each. 500 1 color(s) imprint at $3,281 ONLY $6.56 each. 1000 1 color(s) imprint at $6,231 ONLY $6.23 each.